Alright all you 30 something, put on your head bands and leg warmers, grab your walkman and mixed tape and lets go back to a funkier time, when Atari was fresh and if you couldn’t break dance you were wack. This movie will serve up a heaping platter of so much nostalgia, corny humor and silly plot lines, that you’ll be left with a belly ache. 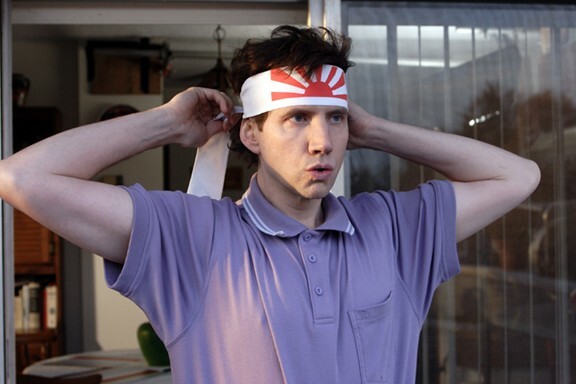 Its typical Jamie Kennedy, so watch any of his comedies (Malibu’s Most Wanted, The Mask 2),and you’ll pretty much know what to expect. Its has its funny moments, but the movie itself is as corny and cheesy as the eighties were. The movie, is about Justin (Jamie Kennedy) a twelve year old boy who leads up a group of break dancers called the Funky Fresh Boyz. He is at the peak of popularity being one of the best break dancers in his school. He even has the affection of the girl he’s in love with, even though his much richer nemesis is making a play for her and competes with him in break dancing. He is the better man and has the girl. At the talent show he battles his nemesis in a break dancing competition and after seeing his enemy give the girl he loves an expensive gift he decides to beat him at all cost and impress his girl. He dances circles around his enemy until he tries a difficult and dangerous move to show he’s the best. His overconfidence makes him miscalculate a back flip and knocks him out, and even though he’s lucky his neck is not broken, he lands in a coma that spans twenty years. All their money spent on medical bills, his parents are severely in debt and can no longer afford to pay for his life support, the decision is made to pull the plug. At the very moment, a janitor walks by with funky 80’s music coming from his radio, and he finally opens his eyes and attempts to dance. Of course he only ends up on the floor, his body atrophied from the years in a coma , but his parents realize their son is alive, and rejoice, then take him home. He is faced with a world he no longer recognizes, technology he doesn’t understand and while everybody has grown up, he is mentally still a child and trapped in the time he remembers. He realizes the girl he loved is now engaged to his childhood nemesis and hasn’t changed a bit, still being every bit the jerk he was at twelve. He also hosts a dance contest that promises the winner $100,000.00 and a year contract at the show. Seeing this as his opportunity to get his parents out of the financial problems, he caused them , and to win back the girl he lost, he gets the now middle aged funky fresh boyz together again to enter and attempt to win the contest and his life back. Now he’ll try to make the 80’s break dancing cool again in an era of gansta rap, hip hop and krumping. Can he kick it old school and reclaim everything he lost? This is a very light silly little flick, something you should only watch if you can tolerate a little corny humor, and if your an 80’s buff. The dancing is also quite exceptional, and the relationship between the adult Funky Fresh Boyz is quite funny and sweet. The movie has its funny moments, depending of course on your sense of humor, but I did find it amusing in sort of a sweet way. Its also tinged with a little sadness, watching what age and time can do to a person, and how things have changed since the 80’s. Having grown up in that time myself it was sad to see how much thing have changed and how much innocence has been lost in the past two decades. This is a great rainy afternoon movie , when you want to watch a movie where you don’t want to think too much, just be entertained and reminisce about a more colorful decade. So Domo Arigato, Mr. Roboto, go kick it old school style. Why isn’t my Mic Working?